Dog Friendly Dealership, Frank Hyundai! 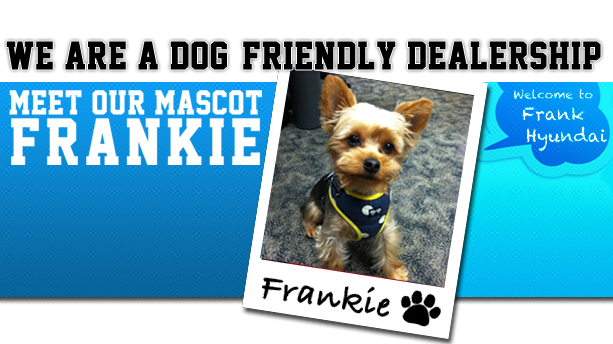 We're Dog Friendly at Frank Hyundai! Here at Frank Hyundai in National City California, we understand the love and care you offer your pet. That's why we always take into consideration how comfortable your dog will be in your decision on a new Hyundai vehicle as well as any convenience features we can offer as an addition to your Hyundai that will aid in the care of your dog. While you are here looking for a new Hyundai Car, Truck, or SUV ask us what choice we think is best when it comes to the safety and convenience for your pet. Our Customer Service Representatives will do their best to provide you with the information you require to make the best decision for both you and your dog! 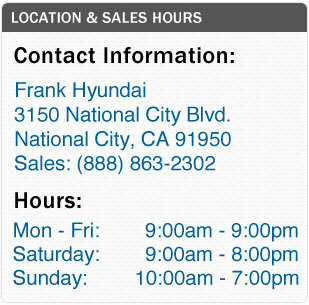 Our Hyundai dealership serves San Diego, CA and is located at 3150 National City Blvd. National City, CA 91950, we hope to see you and your dog soon! Vacations are a lot more fun if you share them with your best friend! Remember that safety for your pet should be the first priority considered if you plan on taking your dog with you on your road trip. It's a lot safer for everyone if your dog is securely fastened or confined during car trips. Remember, also, to attach some form of ID tag to your dog's collar with your cell phone number on it. Some important things to bring include a spill-proof water bowl, your dog's regular food, any medications they take and their favorite toys for playing fetch or tug. It's more safe and fun to go hiking or camping with a well-trained dog. The ASPCA has useful tips on ways to teach your dog not to pull on the lease to make walks through nature the most enjoyable for both you and your dog. It is also important to ensure that you have trained your dog to return to you when called since collars & leashes have been known to break or slip out. Like coming when called, the "leave it" skill can be useful to help your dog avoid such things that might hurt her, such as trash or debris on the ground, sharp objects, or hooks left near fishing spots. Whether you like to hike through the woods, spend the day at the beach or just take your dog for a jog in the park, proper gear and preparation are essential parts of a well-planned outing. Also, ensure that your dog is healthy enough for physical exertion, and that he/she has all the vaccinations needed. A rabies vaccination is particularly important as your dog may encounter wild animals like raccoons, skunks, bats, or foxes. Remember to bring the basics! Items such as identification for your dog, water and a bowl, first aid kit, knowledge of local animal emergency clinics, and activity-specific gear. This and more information can be found at www.aspca.org. Help to keep your dog as safe as possible with proper knowledge and awareness while taking vacation trips.